Ferrets have been kept as pets for centuries, and are now one of the most kept pets in the United States. Their enduring popularity has helped ensure that full lines of ferret care products have been consistently produced, by some of the most trusted brands in the pet industry. Kaytee, Super Pet, Marshall and more have all created top quality products to make sure that your pet ferret has the home, care, food and fun it needs. 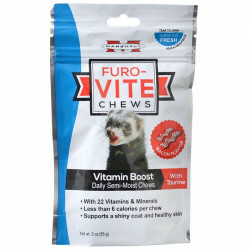 Our selection of ferret supplements allows owners of these delightful pets to provide them with the best possible care, helping to ensure their lasting health, vigor and enjoyment of life. Pet Mountain's Ferret Supplement store features top quality treatments for your little "bandit" from the most trusted names in small pet care, including Marshall, the nation's leading producer of fine ferret care products. Keeping these treatments on hand can help you counteract and even prevent some of the most common issues ferrets face quickly and easily. Marshall Furo-Tone Skin & Coat Supplement for Ferrets contains essential rich fatty acids that help cure dry skin for ferrets of any age. This beneficial supplement repairs dry skin and a lackluster coat to make your pet's skin and coat healthy and shiny. Simply add it to your ferret's food daily! 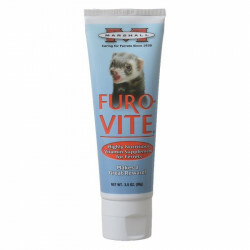 Marshall Furo-Vite Vitamin Supplement for Ferrets is an all-natural daily vitamin paste with a high caloric value. This daily vitamin paste can help provide additional nutrition when your ferret is sick, or going through seasonal weight loss. 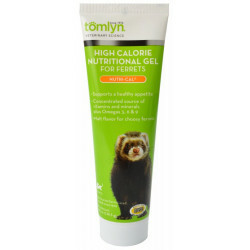 Simply let your ferret lick straight from the tube. Marshall Ferret Lax Hairball & Obstruction Treatment aids in the prevention of hairballs for your ferret. Approved and recommended by leading ferret veterinarians and breeders, this hairball supplement is great tasting, safe, and easy to use.